The IGA store was rumored to be closing but when I stopped by December 30th, it seemed like business as usual with no signage indicating an imminent closure. I stopped by again this past Monday the 2nd and the store was already closed and over 90% of the store's inventory was gone. Not sure when it all happened as there was no sale or anything, just kinda closed and gone. Rumor has it the store will re-open in nearby Williamsburg Village shopping center but I highly doubt that would work. I have lived in the neighborhood near this shopping center my entire life but had not been in the grocery store since the Ed's days years ago. Back when it was a SuperValu, I recall making regular trips there with my family, but the store's overall appearance and food quality seemed to have deteriorated substantially over the years, so I, like many of my neighbors, do most grocery shopping at the nearby Publix and Kroger at Toco Hills and Toco Hill respectively. I'd heard that a Family Dollar had looked at the center for a new store last year but had decided the demographics did not support their concept. Interestingly, not far away, another former SuperValu (and later Ed's IGA and Village Market) at Vista Grove shopping center gave way to a variety of businesses including a package store and Napoleon's, a restaurant. In the same center, Village Market built a gas station in the shopping center's parking lot that currently sits empty. Within the same center, Eckerd gave way to RiteAid which in turn closed and is now a Dollar General. Both the Briarcliff and Vista Grove centers have been proposed by residents as prospective locations for Trader Joe's, but nothing has materialized. Personally, I love my 'hood, but if TJ's won't open in Suburban Plaza, there is no way they would ever open in either center, even if there was room, which now there won't be. Now, with IGA closed, Tulsa, Oklahoma-based QuikTrip plans to open a new convenience store and gas station on the land in place of the IGA store, adjacent parking lot and a small, undeveloped parcel behind the center. It's my understanding that the IGA portion of the aging shopping center will be demolished and that the other businesses like the pharmacy and dry cleaners will remain open. I would love to see the entire center get a facelift, but I'm told that is not a sure thing at this point. QuikTrip, unlike its chief rival Atlanta-based RaceTrac, has a number of existing intown locations. Less than a mile and a half from the location at Clairmont and Briarcliff, QuikTrip operates a unit at Briarcliff and North Druid Hills Roads. QuikTrip also has a location further down Briarcliff, near Clifton Road. Overall, Atlanta is QT's largest market, with over 120 locations. RaceTrac, in comparison, has just shy of 70 in the area. QT entered the market 25 years ago, whereas RaceTrac had a 50 year head start. In 2010 QuikTrip launched what it calls "Gen III" stores which are about 1000-square feet larger than typical locations. (5700 s/f compared to a typical 4600 s/f.) If I counted accurately, the coming Doraville location will have 20 pumps, about twice that of typical intown locations. The Doraville location is located just inside the perimeter at Buford Highway and Stewart Road on the site most recently home to a Shell gas station. In addition to an increased number of pumps at high traffic locations, Gen III stores also carry a wider variety of prepared foods and have a slightly different interior layout, dual side entrances and seating outside in front of the store. Smoothies, soft serve ice cream and specialty coffee beverages are also likely to be found in Gen III locations. Take & Bake pizzas and single-size lasagna were also recently added to the food offerings. I'd also heard of up to 16 different teas and 10 variations of frozen beverages being offered at new locations. Much, if not all, of the prepared foods are made at QT's ever-expanding Ellenwood QT Kitchen commissary. The first three Gen III locations opened in the company's home territory of Tulsa, Oklahoma, and after proving successful, were expanded to other markets. Atlanta will soon have a number of these locations with one scheduled to open next month in Morrow on Jonesboro Road. The aforementioned location in Doraville, as well as another location in Suwanee at Lawrenceville-Suwanee Road and Satellite Boulevard, are both scheduled to open in March. Henry County will also get a Gen III location later this year in Locust Grove, but as it was only announced last week, I'm not sure when it may open. Another location was proposed at Ormewood and Moreland Avenues in Ormewood Park, but after fierce opposition from the neighborhood, QT will not build on that site though they have stated they are still interested in the area. As the Briarcliff Shopping Center is already zoned for C-1 commercial, I'm told no community meetings were held and therefore it was a bit difficult to track down details of their plans. Calls to various real estate and public relations officials at QuikTrip were not immediately returned but I hope to have an opening timetable soon. I'd anticipate this location will be a Gen III but likely not as big as the upcoming Doraville location. As a lifelong resident of this exact neighborhood, I personally welcome the QuikTrip and see it being successful, but possibly not popular with all. Presumably, the station will have access from both Briarciff and Clairmont, making access in and out easy. The shopping center is well situated in a high traffic area. Interstate 85 is less than a half mile away with many commuters making their way to the nearby CDC, VA and Emory campuses. In addition, students and parents of Cliff Valley School, Sagamore Elementary and Lakeside High Schools pass through this intersection as well. Across the street from the planned QuikTrip, there is an existing Chevron that just re-opened last month after being closed since early August. In the early morning hours of August 4th, two cars were involved in a collision that forced one vehicle to careen off the side of the road and into a gas pump at the Chevron. Both vehicle and pump burst into flames and it took months to sort everything out. Additionally, there is a Shell gas station closer to I-85 and a BP on the other side of I-85. A couple of years ago, the Sam's Club (on the site of former Kmart) added gas pumps to their store as well. Having attended the National Association of Convenience Stores (NACS) convention in 2009, I witnessed first hand C-store operators and vendors extended moves into the food industry. Already in competition with other convenience stores, adding so many food and beverage offerings puts them in competition with both fast food eateries and coffee houses like Starbucks. Given QT's sterling reputation for clean stores and courteous sales associates, similar to that of Atlanta-based Chick-fil-A, the company seems destined to continue to grow and prosper in Atlanta and beyond. Do you live in the neighborhood and feel the QT is a good idea, or are you just another NIMBY type person? Did you patronize the grocery store from national chain to IGA and already miss it? Does this new QT concept store sound like too much or is it just keeping up with the times? Share your thoughts in the comment section below. I bet the neighbors are gonna hate the short term rat infestation that happens when they knock that wretched building down. Good riddance! Now they need to keep the tempo going by flattening the Williamsburg Village shopping center located diagonally across the street from the IGA. As we were traveling over the winter holdays, we happened to stop at one of the Gen III QTs in South Carolina. It was beautiful! Your analogy of QT being the Chick-Fil-A of convenience stores is a great one. I'm glad they'll be in the neighborhood! I've been passing through this area for regularly for many years. I've always considered these old shopping centers at the intersection of Briarcliff and Clairmont to be eyesores. The worst is Williamsburg. I'd be happy to see them all come down (though with the better businesses, like Desta restaurant, surviving with a relocation). Interesting choice, as there is also a QT on Buford Highway just north of Clairmont Road (next to Plaza Fiesta). While I never shopped in that IGA due to its appearance, I am concerned about the added traffic load on Briarcliff. Traffic already backs up quite a bit for traffic turning left onto Clairmont, and anyone trying to turn left into that QT from Briarcliff is going to add to the backups. It will be interesting to see what this does to the gas prices in that area as well, as that Chevron and the nearby BP are typically higher than average in their pricing. I also was recently driving from Atlanta to Charlotte and passed 2 brand new QT's, 1 of which had a huge sign saying "Opening Next Week." Both of them looked amazing from the outside. I've been extremely impressed with QT's food offerings. If you sign up on their web site you can do monthly surveys in exchange for free food! Good work Eli on this breaking story. I've lived in this neighborhood my entire life as well and I am glad to see the IGA go. I do know some people who shopped there religiously and that the store was popular with some of the retirement villages around it. I honestly only recall going into the store once, when it was a Piggly Wiggly. Honestly the shopping center's appearance is a bit of a turn off, plus the fact that in general it looks deserted, even though businesses are open. The whole shopping center could use a face lift, but the QT is a start. I think that it'll do really well there and will be easy to access. It'll be nice to have some competition in the area though - the BP by Sam's & the Chevron that just opened are usually higher than most stations in town and QT is always significantly lower. We already have a Chevron directly across the street, a Shell about 400 hundred yards away, a BP on the other side of I-85, and Sam's Club behind the McDonald's at I-85, so I would rather not have yet another gas station. I think Atlanta has way too many gas stations already. I will definitely use the new QT as I already go down to the Qt at Druid Hills and Briarcliff. This is much closer for me and it is on my way to and from work. I'm happy to see the IGA go (my kids and I called it the "stinky store" and only went in there when we were desperate), but I'm disappointed a Quik Trip will be there instead. We certainly do not need another gas station in that area. Too bad something more interesting won't be there. It's a missed opportunity. Thanks for the story. I agree about the traffic in an already congested area. QTs are good stores, but they do bring a lot of traffic, I guess because there gas prices are very competitive. The IGA was disgusting. I'll bet the expiration dates had long since passed before the products sold. QT will hopefully put some of the poorly run Gas Stations quickly out of business. Most of the other stations are .25 cents higher than what QT sells gas for. Let's get Trader Joe's to take over the Williamsburg Shopping center. It's worse than the IGA center. Lot's of low end businesses that don't seem to have any relationship with the nearby neighborhoods. Stopped in the new concept QT in Spartanburg, SC on my way home from the holidays. It's awesome and I was waiting to see if one would open up in the ATL. And glad to see they're finally going to put a QT at Buford Hwy & 285, seems a no brainer to me. Not sure having a QT so close to the Briarcliff/N. Druid Hills makes that much sense, but it would be easier to get in and out of than the one across from Loehmann's Plaza. In addition to Williamsburg Village, the next eyesore that needs to go is the Vol-Repairs II repair shop. DeKalb County: planning is needed for traffic with this new station. It's already really bad there. QuikTrip: include basic groceries, and find room for the European specialties that were the only interesting thing about the old IGA (other than its generally scary atmosphere, which might have been good for shooting a horror movie). Happy to see redevelopment in that area. I drive through there regularly. Recently, sitting at the traffic light at the Clairmont/Briarcliff intersection I was just thinking how bad the area looks. I suppose it would be nice to have something other than another gas station but hey, I'll take what I can get. In my mind, this is good news!!! All Four corners should be torn down and redone!!!! It is an eyesore!!!! I am surprised you thought it was "business as usual" on Dec. 30, as I was there Dec. 27 and the shelves were half cleared already - they were offering 50% off, and i heard one person left with four full carts of wine! I wish another small business would come, but most of us did not support IGA or Village Market sufficiently for them to survive, so it is not going to happen. Although we don't really need another gas station, we do need an honest one in the neighborhood, and my experiences with price gouging at the Shell and the Chevron back when we had a "gas shortage" have kept me from patronizing those businesses any more. I miss the gas station at Vista Grove! The Shell at Toco Hills used to pad the gallons (the only time I EVER "put" 19 gallons into my 18-gallon tank), so I will be happy to see some reputable competition. Some people really relied on that store. For those living along the access roads, there is no closer store than the Publix at Shallowford or the Buford Hwy side of Clairmont. Not easily accessible without a car. Every time a small supermarket closes, a small segment of our less able population suffers a loss. IGA started selling off its inventory at 50% the day after Christmas. The employees told us that QT was getting about 1/2 of IGA's space and that IGA would keep the other half. We'll see. Doesn't sound all that realistic. FYI, the Chevron and the Shell are owned by the same person, so gas prices will be interesting once QT comes in. And the Vol-Repairs II shop is rumored to be moving to Decatur. It makes me sad to read people are "excited" to have a cookie cutter convenience store replace an independent grocer. The IGA was run by nice folks doing their best with limited resources while competing against big chain supermarkets. It was a valued resource for the surrounding elderly and immigrant communities. You people who want everything to look like Disneyworld make me sick. When the QT makes the already bad traffic situation at that intersection unbearable, you better keep your complaining pieholes shut. Have lived in Atlanta since 1984 and my first abode was on Woodcliff Court. I shopped almost exclusively at the IGA, which was then a Super Valu. My kids went to Sagamore Elementary at the time. Over the years, it concerned me that no one took the lead to upgrade that store. I love the Briarcliff Pharmacy and do hope they will be able to stay. There are so few local stores these days. QT does have an excellent business model, however, and I hope they will hire locals where possible so folks can see a familiar face when they buy gas and sundries there. Would love to see an upgrade of the entire property, without losing the charm that used to be. 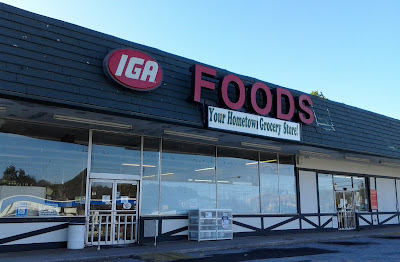 I'd learned that the IGA was set to close on Dec. 30, was told that they will move across the street. I rarely visited the grocery store--it smelled awful inside--but it's literally across the street from my condo and thus a convenient option to pick up some items. I hope that this report is wrong because we do not need another gas station! There's already a QuikTrip 1 block away and a Chevron on the same intersection. Adding another gas station will do nothing to enhance the quality of the neighborhood. I was hoping for a Trader Joe's or some nice restaurant or really any destination work walking to. The VOL II repair shop and dealer across the road from the IGA spot is set to move to Lawrenceville and I very much liked the idea of both sides of the street getting some more upscale sorts of businesses that might help improve home values. Another gas station does nothing of the sort. Great - another gas station. I agree with above, the corner on all four sides needs to come down and built new. I've seen the Gen III QT's, though nice not a place that I will hangout at or frequent for food. I live less than 1/4 mile away off Briarcliff and have been waiting 14 years for this corner to improve. QT is not the answer - this will only hinder re-developing the entire area. Easy in, easy out access? Not sure about that. Exiting cross 2 lanes of traffic to go left onto Clairmont? Not easy. Exiting to go left onto Briarcliff going towards N. Druid Hills? Not easy. see ya Stinky IGA, with your dead animal smell and rotting cheese smell. I wish it could be a Trader Joe's! So either I think a QT is a good idea or I'm "just another NIMBY type person"? OK. I also live close by and while I'm not that sorry to see the IGA close I don't think a QT will add anything to the area. If anything I wish they'd bulldoze the Vol-Repair corner and put it there instead while finding another grocer for the IGA spot. Traffic on Briarcliff already backs up all the way to Immaculate Heart of Mary whenever church lets out. This will just make it so much worse. The IGA was the only store left that carried those canned peaches that taste like the home-canned ones, they're from South Carolina. I will miss the store, even though it needed a good cleaning. I am concerned about the probable large increase in traffic. Especially at rush hour. I thought it was cool when Ed was running the stores. When I first moved to the area, I asked an employee about an item at the Oak Grove location, and he said, "why don't you ask Ed, he's over there," and indeed there was Ed, sweeping up his own (clean) store! I liked that. I stopped in at a QT Gen III store about 3 weeks ago, while driving back to Atlanta from the Carolinas.... In my opinion, it's a great step up and a move in the right direction for QT.... from what I remember, there are 5 beverage stations - one in each corner (each one dedicated to a particular type of beverage - coffee, iced tea, frozen drinks and sodas) and a coffee counter where one can order a coffee beverage customized much like you could at Starbucks and Caribou. The remainder of the store is dedicated to expansive prepared foods offerings, including fresh cut fruit and yogurt and salads, definitely capitalizing on the move towards healthier eating. Lot's of rat's will come out of there. You know where they will go,to the nearest food resource. I'm encouraged so many people are pleased with the new addition. I wish it were going to be a Trader Joe's, but anything will be better than the IGA which has gone from bad to worse over the last 5 years. Many folks in the neighborhood were able to get quite worked up protesting the erection of new cell towers near Briarlake ES and Lakeside HS, worrying that some day maybe someone might be able to establish a link between cell tower emissions and brain cancer, pointing to shoddy flawed research, while simultaneously providing cell phones emitting stronger signals for their kids to hold up right next to their developing little brains. Let's see if any of them recognize the far more dangerous situations that will be caused by adding a gas station with multiple curb cuts at an intersection that is completely clogged during rush hours. What's the over-under on the time that will pass between when the doors open and the first injury crash. Fortunately there is a fire/EMS station just down the block. I remember finding a smelly, maggot covered egg behind a cooler in the dairy section back when I worked there. That may have been the dead animal smell some remember. Do QTs really lead to increased traffic?!? I don't see it as much of a destination. Potentially, if QT is able to cut dedicated turn lanes into the existing lot, traffic should not be impacted (i.e. a car heading east on Briarcliff would first enter a lane that allows for gradual slow down, and then a right turn into the qt, as opposed to having to do the full slow-down on Briarcliff). I used to live in Maryland, and in general I've noticed that the local roads/engineering departments are really bad at making lanes for these type of things (often using curb angles that cars can't negotiate instead of using a gradual curb curvature that car wheels can negotiate). In MD, they were very good at using gradual curvature, not 'trapezoid' type angles that don't help at all. Well, there certainly seems to be no likelihood that a QT would result in LESS traffic, so that's out. The real estate group at QT, like those at McDonalds or any other major retailer, study current traffic counts in detail, and seek to predict the ability of a station in that location to draw customers that would otherwise be likely to be heading elsewhere for gas, food, drinks, etc. By the look of the other two nearest stations, I'm betting most drivers stop there only for gas, with no interest in entering the store. I know I will take a different route than normal when I need gas, just to go by a clean new station with a store that looks nicer, feels safer, consistently offers the lowest price on gas in the area, etc. With a QT on that corner, I will now tend to drive to that intersection instead of looping over to North Druid Hills, or Buford Hwy, or Lawrenceville Hwy when I need to fill up or want a c-store. So... sorry neighbor, but you definitely will be able to add my car to the current traffic counts a time or two every week. I don't drive through there too much so no problem from my standpoint. Will be interesting to see if they configure the ingress and egress on Clairmont in such a way to deter the left turn from Clairmont. I think that there's an extra lane on Briarcliff that will let cars go around someone trying the left turn from there. Live in the area. Only went to the IGA once and it was disgusting. It did have a bad smell in there. Not happy about the QT though. Although I like QT it is going to mess up the traffic. Agree with what some others have said....a local store or restaurant with more character would be nice. I do like going to the drug store in that shopping center so hopefully that will stay. This will doom the Chevron, no problem, no loss. I call these mega-stations "sixteen-bays"-testiment to our oil indulgent lifestyles. No worries--all gas stations will be gone in 20 years. Planning the four-corners: The properties being redevelped as individual propoerties here just shows how little our comnunity affiliates with by-the-highway commerical areas that are between neighborhood areas. Contrast that with the insistence on planning Emory Village and Toco Hills as "total" development--all corners at once. Planning is happenig at Oak Grove also--all three considered what the county calls "neighborhood centers". I live in the area as well and welcome a clean, bright, fairly-priced QuikTrip. I often stop in the Shell station on my way home from work to get gas, but it is a bit sketchy. My husband swears he got in the way of a robbery there once. It's a great, convenient part of town. I don't want to see those 4 corners become chain-restaurants or other big businesses, but some revitalization would be hugely welcomed and great for the neighborhoods. While we're at it---how about some sidewalks for Clairmont Road???!? The loss of the IGA is no loss at all. The store hasn't been kept up in years. I echo the comments that I find it hard to be excited about another gas station, however I would welcome a well run operation like Quick Trip. Plus their prices are so much more affordable then what is there now. In a larger context, with the Vol Repair shop exiting their location, this would be a wonderful opportunity for a study of the whole 4 corners area. I think a good redevelopment plan is in order. The Williamsburg center is old and an eyesore. That and the apartment homes behind it would be ripe for redevelopment. I would like to see the area become more pedestrian friendly as well with more greenspace added. Roundabout anybody? I'm not as old as dirt, but I do go back to when there were cows grazing at Briarcliff and North Druid Hills. I have fond memories of the two Ed's IGAs and much less fond feelings about how far down things got at the hold-your-nose Clairmont location once Ed departed, although I appreciated being able to park close to the store and the curious product offerings. It seems clear that QT will open with any configuration that will get traffic into (but not necessarily out of) their location. However, once you've gassed up, it's like the Hotel California; you can check out, but you can never leave. You might need to refill again before you can exit. Heaven help you and the other drivers if you want to turn left out of either the N. Druid Hills entrance/exit by the school or the Briarcliff Road entrance/exit by the Boston Market. The new QT going in at Clairmont/Briarcliff, might generate similar difficult exit situations. Since Clairmont is a state highway, I imagine both DeKalb County and the state of Georgia have a piece of the action in redesigning the intersection. It seems that this is the time to push for a dedicated left turn lane on Clairmont, so that those turning left into the IHOP and Wells Fargo Bank do not impede southbound Clairmont traffic. There certainly looks to be sufficent property along the county right-of-way to accomplish that. Acceleration/deceleration lanes also might be appropriate, as well as a dedicated right turn lane from Briarcliff to southbound Clairmont. The current entrance/exit at the drugstore end of the property should also be redesigned to clearly allow for an entrance lane as well as separate right turn and left turn lanes. That is currently a sometimes problem and will only get worse with the additional QT generated traffic. The current entrance/exit on Clairmont nearest to Briarcliff might also need to be redesigned to become either entrance-only or entrance and right-turn only exit. If not, you'll end up with some cars trying to exit by turning left into the heavy traffic at intersection; they'll get part-way out, and end up blocking southbound Clairmont traffic. If the Vol-Repair is leaving, it might also be the time to have a dedicated right turn lane from southbound Clairmont to Briarcliff. While they're at it, a right turn only lane from northbound Clairmont to Briarcliff might be considered. Southbound traffic on Clairmont already often backs up to I-85 and Northbound traffic on Clairmont already often backs up to Audubon or even Council Bluff. QT appears inevitable, but now is the time to contact Jeff Rader, DeKalb County District 2Commissioner at jrader@dekalbcountyga.gov and Kathie Gannon, DeKalb County Super District 6 Commissioner at kgannon@dekalbcountyga.gov. Depending on where you live in relation to the Briarcliff/Clairmont intersection, your State Representative might be Mary Margaret Oliver or Mike Jacobs and your State Senator might be Jason Carter or Steve Henson. If you have an interest in this issue, make sure your voice has a chance of being heard while redevelopment is in an early stage. This is a once in a generation chance to try and get it right. Compare this intersection with that of Oak Grove at LaVista. Oak Grove has a much smaller traffic volume but the age of the buildings is the same. In order to fix the intersection at Clairmont/Briarcliff you'd have to replace many businesses like the IGA, the Chevron (enormously overpriced), the Volvo place (very unsightly) etc. You'd need community restaurants/shops AND you'd have to fight crime constantly in order to get it under control in that intersection. A Quick Trip will drive the closure of the Chevron and Shell and prevent any other gas stations from coming into the area (which is fine since the current stations are so overpriced). I see no point in the IGA reopening across the street. It's too late for them. Too bad, I used to go in there to get non-fresh items like wine, cola, cereal, honey etc. I agree that the old IGA needed to go. The place smelled like it was held together by mold. I don't know that a gas station is the best replacement, but if we're going to get a gas station, I think QT is the best option. I'm with those who think the whole corner needs redeveloping. Williamsburg Village and, perhaps worse, Williamsburg Apartments, are a blight on an otherwise solid neighborhood. That is not to say that all the businesses in the Williamsburg Village are bad -- just the shopping center itself and the horrible parking lot situation. I had heard rumors that the IGA was moving to the Williamsburg location of the former Pure "special event venue" -- any truth to that? I've lived here for a long time too. Been through the Supervalu to iga conversion. Does seem to have gradually gone downhill. Hoping for competitive gas prices. We must have the highest in metro area. I got gas in gwinnett, forsyth and cobb whenever i could; and otherwise went over to Buford Highway. Would be nice to have something close. We really need a sidewalk on Briarcliff between Chrysler and Crestline before someone gets killed walking along there - and past Chrysler toward Lakeside High. But QT replacing Ed's and Vol Repairs leaving are both great news!! Unsightly? We have been spoiled living in the "new south". I recently heard a curator at the Atlanta History Center mention Atlanta's attitude, " If you want historic buildings go to Savannah". While I am in agreement that some clean up in the 4 corners would be appreciated, and will not shed a tear about IGA closing, it does show that customers vote with their pocketbooks and if you don't give a good customer experience a business will not survive. Several of those businesses you have mentioned while not the prettiest/modern of exteriors are excellent members of the community and I would be sad to see them go. Mo's Pizza comes to mind. Older building sure not as aesthetically pleasing as Fellini's on Lavista but I sure love the place. The post office is old and inconvenient but I have heard the neighbors complaining about it possibly closing. George's Cleaners is run down and no Taj Mahal but some of the nicest people and best cleaners in the community. I for one would be happy to see a respected business like Quicktrip in our community, and it would improve the aesthetics of the corner, but remember don't judge a book by its cover. Try some of the great small businesses located in these buildings you would rather see torn down and replaced. My brother owned Vista Grove Super Valu and was Ed's partner in both Ed's IGA's. The stores were old. The equipment was as old and cost a lot of money. Money that had to buy new freezers and coolers could of been spent on other more noticeable improvements. When the Oak Grove store was closed/sold it was heartbreaking but all had high hopes on Clairmont. Both were fun stores to work in and at. The Oak Grove store had kids from all over the neighborhoods working and Clairmont only attracted a few. It wasn't long before the un-fortunate residents of Days Lodge began to over run the store and it was a battle catching shop lifters and watching the employees who were stealing. Both stores were limited on space and the poor numbers that shopped the stores made it difficult to carry as many items due to dates and low turns. Both stores were predecessors to what is soon to happen in the rest of the country. The small business man will be gone. Sad state of affairs. There were and are some good memories from those days. We fondly called this the stinky store but its really too bad, they had great produce prices. I hope that whatever replaces it is something that fills a gap for the community. Not sure that we need yet another QT. Piggly Wiggly, SuperValu, Ed's IGA, and Food Universe IGA. It's been an interesting 50+ years! I've only visited the N Druid/Briarcliff QT once because it's so much easier to get into and out of the QT between Buford Hwy and Dresden on Clairmont. When I moved here in 1971, there were about six gas stations around the Briarcliff/Clairmont intersection, A&P had a store in Williamsburg Village, and K-Mart (where Sam's is now) sold groceries, too. Big Apple/Food Giant were Alterman Foods "brands" in this area, both did well for a long time before larger chains took over the grocery business. I would like proof of these said “rats” infesting the IGA building. I would like proof of these said “rats” infesting the IGA building, I have shopped here many times and not once a silly rat showed up. Are you sure that you have proof? I am greatly saddened to hear the beloved store is now closed for good. It troubles me to think of how all the IGA employees are to find work in this economy; surly one would have sympathy! Just think about how these people find themselves out of a job, especially when the job market is as bad as it is now. I think the whole strip needs a face lift (not saying it’s an eye sore), it is obviously built from an earlier time, but tearing it down is extreme. I believe this can easily be solved by a community driven facelift. I wouldn’t mind improvement, I applaud it, and I embrace it! Concerning the Williamsburg Village area, I agree with the first reply, well somewhat, the area needs improvement as well. However, not as a drastic approach! A remodeling is in order for both areas, this is old news, and has been for quite some time now. I am surprised that the issue has just come to light. I've lived in Sagamore Hills my whole life and good riddance to the IGA - it literally stunk and the perishables were already perished. An awful store that I'm glad to see gone, and I would support demolishing all 4 corners as someone else said, and start completely over -- maybe this will start that process. And although QT is going to create a traffic nightmare, it would give competition to the other gas stations and bring their prices down, they're ridiculous. But why were no public hearings held or news stories published before all this took place? I don't understand how this came about without public input. I would MUCH prefer a Trader Joes at that location; we definitely need a quick and convenient small store at that corner, but I'm not going to fight the traffic to get into QT just to get some bread or milk. I really hated it when the Village Market left, that was a really nice little store. Will be interesting to see what happens. Sorry, but the Volvo Repair eyesore on the corner is NOT moving according to the owner as of 1/14/12. I spoke to him and he said his brother is moving - this must be the garage next door. This corner needs to be cleaned up and I suggest anyone interested in seeing this happen should call Dekalb County Code Enforcement and Commissioner Rader. I vote for a Chipotle on the corner!! As I said in the post, the likelihood of there being a Trader Joes built there or anywhere in the immediate area is about zero. I'm a fan of TJ's and heck, it'd be great to have em close by but the fact of the matter is, they have no immediate plans for more locations in Atlanta and the (city of) Decatur would be a far better fit for many reasons if should new stores for Atlanta become a possibility anytime soon. Vol-Repairs II would also be appreciated. It's surprising that news about a gas station can generate 56 comments! I have news about this project and other upcoming QT's and will be posting about them in the coming days. Please stay tuned and follow me on facebook and twitter for updates as well. I've posted an update to this story and have news on another nearby location.